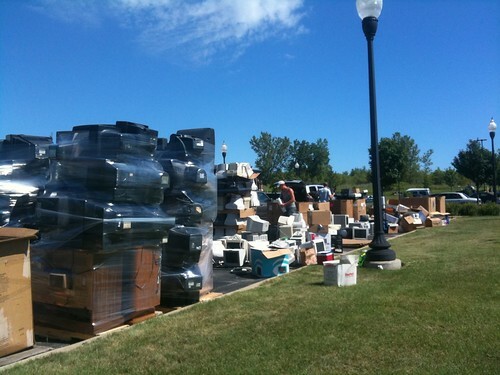 Algonquin, Illinois in McHenry County offered electronics recycling this week at the Public Works building. By 10:30 in the morning, a half mile long line of cars were lined up for the three hour event. We waited in line for over one hour to unload our goods. There were eight foot tall piles of computers, big screen TVs, computers, printers and miscellaneous electronics in stacks all over the parking lot. Forklifts transferred the once high tech toys to semi truck for disposal. “It may be green to recycle but what about all the gas these cars are wasting while they idle in line”. It is a good sign to see a large number of people participating in these events. I would like to see them scheduled more frequently. Still looking for a place in the area that accepts used batteries. Any suggestions?